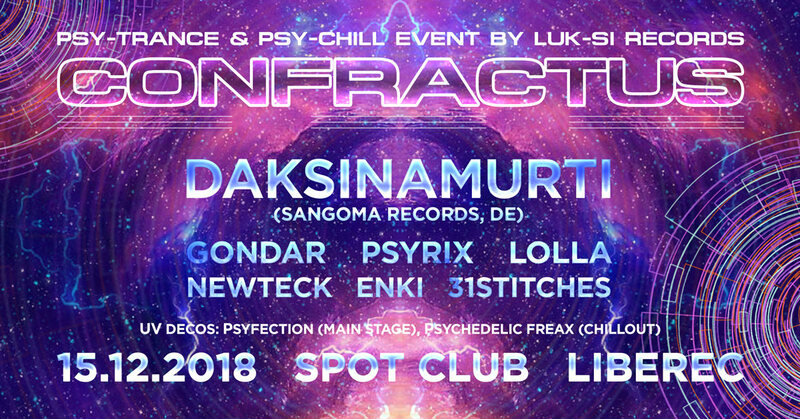 Luk-Si Records presents another part of psy-trance events Confractus. The event will be on December 15th at Spot Club (Liberec, Czech Republic). This time we have prepared for you a special guest! This is German DJ, producer and label manager Daksinamurti. Co-founder of the German-African label Sangoma Records. Other guests at the main stage are the legends of the Czech psytrance scene .. djs Gondar, Psyrix and Lolla. A beautiful UV decoration on the main stage will be prepared by members of the Psyfection crew. And again, you will not miss a second, quiet Psy-Chill stage where you will be able to rest in peace and for a moment to turn off the flow of thoughts. This time, the experiences will be enhanced by Psychedelic FreaX UV decoration.